On this date in our family history . . . the 28th day of October . . . in the year 1899 . . . Josephine Wingfield Henry nee Davis dies of a broken neck in Milam County, Texas . 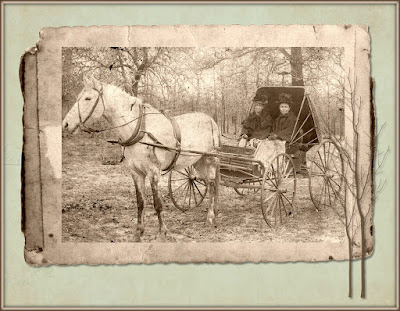 . . this Josephine is a maternal 2nd great-grandma to the Keeper of this family history blog . . . The news of her tragic death was reported in multiple newspapers, including the following article from the November 2nd edition of the Rockdale Messenger, which makes mention of her "gray mare" which is currently believed to be the animal in the above photo* . . . Accident - Mrs. W. P. Henry who has lived on the Cameron road, 3-miles from Rockdale for over 20-years left her son’s home on the Dr. A.C. Isaacs farm, about 3-miles beyond her home, to come home and as was her habit, she pushed her buggy animal, a gray mare that she has driven for several years, into a lope. She drove over the hill at the home of George Banzhaf and turning down the hill, Mr. Jenkins and Mr. Bradly were going from Rockdale to their home beyond Minerva in a light spring wagon, seeing the vehicle coming down the hill near them, pulled their team, a pair of young mules, to one side to give the road, but before the left wheel had cleared the track to the right fore wheel of Mrs. Henry’s buggy struck the hub of the wagon wheel and smashed it. The woman had probably never seen the wagon or saw it too late to stop, and she was pitched foremost and fell with her head between the left fore wheel of the buggy and shafts and was so held that her hair was wound around the buggy hub and spindle and she was held there until some young man, met the buggy at the gate near the old Ferguson place, more than a half-mile this side of where the accident occurred. She was dead when found as her neck was broken. She was buried at the Pleasant Grove cemetery Sunday evening. She leaves a husband and five grown children, three sons and two daughters, all married. Brother Henry does not blame the drivers of the wagon for the accident but thinks they should have ascertained the results before driving home. *P.S. . . . this photo is from the private photo collection of Josephine's daughter-in-law and is not labeled . . . the lady on the left closely resembles other photos of our Josephine . . . enough so for us to think it is indeed grandma Josephine (1842-1899) . . . at this time we do not have any idea who the lady on the right might be . . .
On this date in our family history . . . the 28th day of October . . . in the year 1915 (exactly 100 years ago today) . . . Charlie Muston dies in Wharton County, Texas . . . this Charlie is the paternal great-grandpa to the Keeper of this family history blog . . . The following announcement of his death was published in The Rockdale Reporter on the 4th of November . . .
Tanglewood. Oct. 31. . . . Our community was saddened Friday by the news of the death of Chas. Mustin, a former resident of this community, and at the time of his death was living near Bay City. Frank Mustin, his brother, left Friday to be at the funeral. The sorrowing ones have the depest sympathy of this entire community. Based on stories told by Charlie's seven daughters, the following has been recorded regarding the time leading up to his death . . .
As Emma made a final check through the rural Lee County cabin, Charlie was busy hitching up the team (Jack the mule and Bill the horse) for the trip south. Emma had been born in Lee County in 1882, and was not quite eight years old when her Father died there in 1890. This attempt at a new life was probably the first time Emma had traveled this far from her widowed Mother. Charlie was hoping to find gainful employment in the road construction business to help support his ever-expanding family. Family friends who had already made the trip, and were living and working in Wharton County, included Jim and Polly Hooper, Charlie and Carrie Jensen, and Delbert and Allie Rodgers and their daughter. Emma and her girls set up housekeeping in a wood-frame house in the community of Taiton (on State Highway 71 eighteen miles northwest of Wharton in northwestern Wharton County). 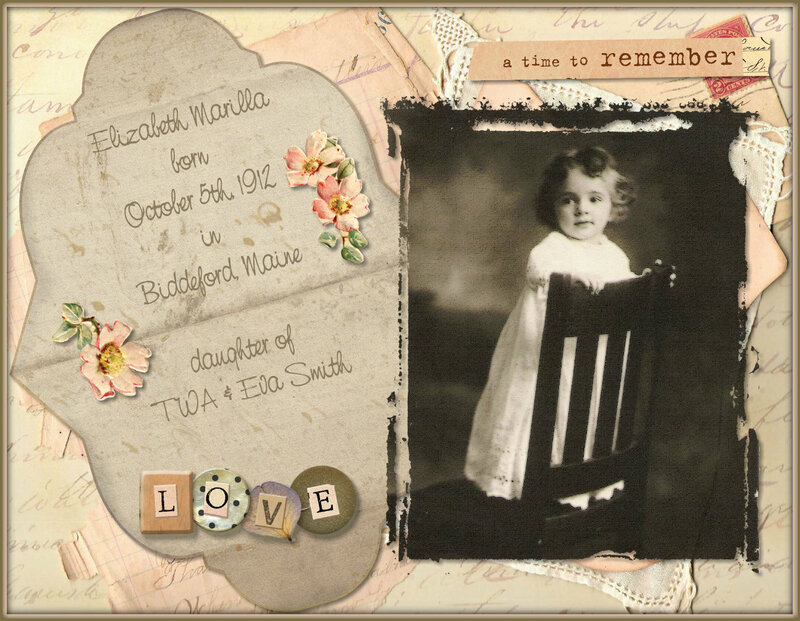 On the first day of September in 1915, Emma gave birth to her seventh baby girl. Less than two months later, on the 28th day of October, Charlie died unexpectedly -- of "pernicious malaria, comatose form" (as per his death certificate). Charlie was buried in the Nada community (on State Highway 71 in southern Colorado County, just north of Taiton). Charlie's final resting place was an unmarked grave just outside the grounds of a local church cemetery. Because he was not a member of said church, his burial was not allowed inside the "consecrated" grounds, hence, he was buried (in a pauper's grave?) somewhere in the perimeter outside the official cemetery grounds. Labels: 20th Century, Family Photos, Lee Co., Month of October, Muston, mycanvas, Paternal Ancestors, scrapbook, Wharton Co.
On this date in our extended family history . . . the 20th day of October . 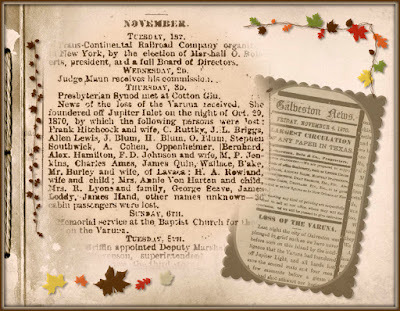 . . in the year 1870 . . . Allen Lewis is one of several individuals who perish in the sinking of the steamship Varuna . . . this Allen Lewis* is the husband of a 3rd cousin five times removed to the Keeper of this family history blog . 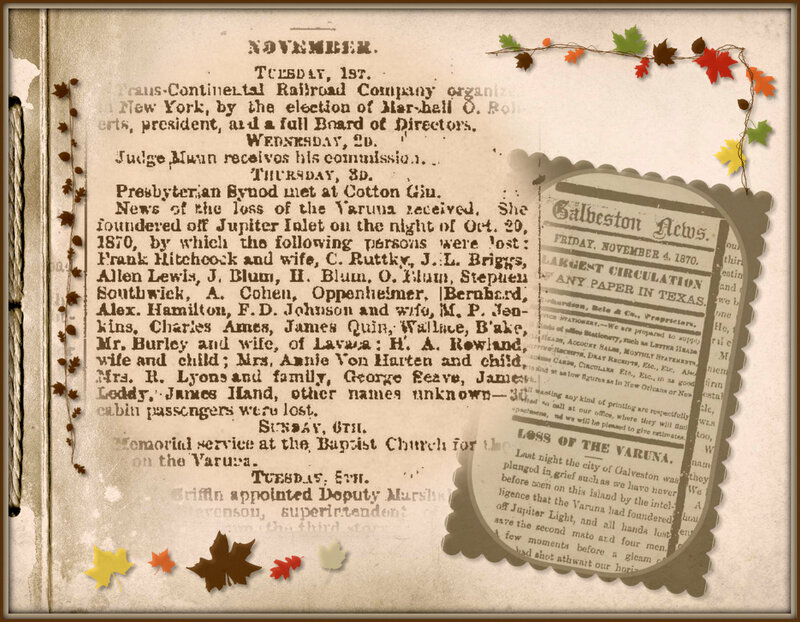 . .
On Saturday night, October 15, 1870, the steamship Varuna, Captain Spencer, left New York for Galveston with thirty-six cabin passengers. Up to the morning of the 20th the vessel had fine weather and a smooth passage. A gale then began to blow, and increased in violence until night, when it became a hurricane. All went well, however, until 8 o'clock, when the wind suddenly veered to the southwest, and the steamer became unmanageable, being careened to the port side, when the water rushed aboard, staving in the bulwarks and cabin door. Attempts were made to get the steamer off before the wind, and all the steam possible was turned on, and the efforts to secure the cabin door alike proved fruitless. By this time the sea had staved in the engine house, and the water was rushing down into the fire and engine rooms at the rate of many tons a minute. The steamer beginning to sink, a number of the crew took to the small boat and succeeded in making the Florida coast. The captain, other officers, and every passenger, were drowned. Some forty five persons perished by this disaster, and among them were many of Galveston's oldest and most valued citizens. When the news of the steamer's destruction was received, the entire city was draped in mourning. Among those passengers were Frank Hitchcock and his wife . . . this Mr. Hitchcock was a friend of James Madison Hall, and is mentioned frequently in Hall's 1860-1866 Journal . . .
Sixty-five years ago today . . . on an autumn's Tuesday . 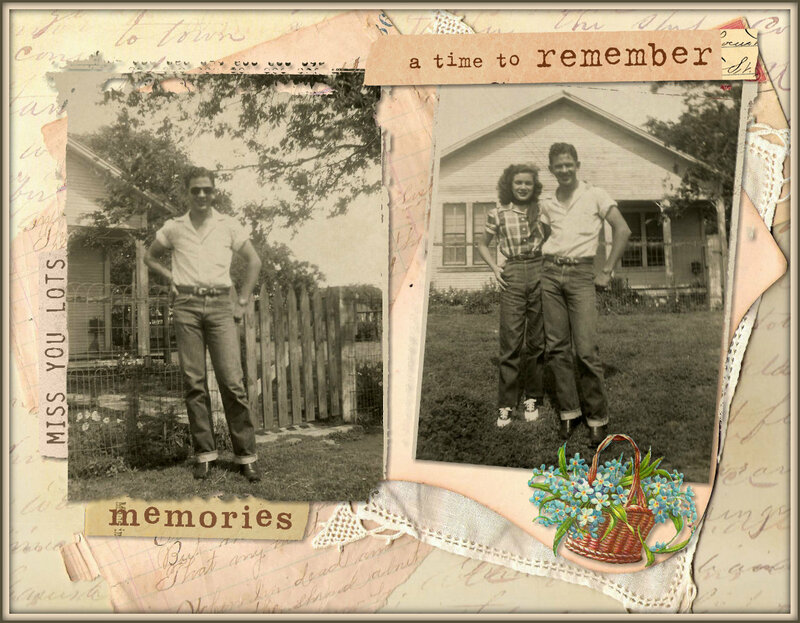 . . which was the 10th* day of October in the year 1950 . . . Miss Roberta Mae Henry became the bride of Mr. Forrest Lee Pounders in a small ceremony held in Freeport, Brazoria County, Texas . . . exactly one year and one month later, I came along as the first of their four children . . . the following photos were taken near the beginning of their journey together . . .
A marriage of interest to a wide circle of friends here is that of Miss Roberta Mae Henry and Forrest Lee Pounders, both of Rockdale. The ceremony took place Tuesday, October 10, at 6:45 o'clock in the evening at the First Methodist church in Freeport, with the Rev. Houser reading the double ring service. The bride chose for her wedding a suit of royal blue gabardine with which she wore gray accessories. In keeping with tradition she also wore something old, something new, something borrowed and something blue. Attending the couple were Miss Georgia Faye Henry and Robert Henry, cousin and brother of the bride. Immediately following the ceremony the couple left for Galveston where they spent a brief honeymoon and later went to Houston to visit with relatives of the groom. The bride is the daughter of Mr. Robert E. Henry of Sinton. She has made her home here with her grandparents, Mrs. Edgar Henry, and the late Mr. Henry. She graduated from Rockdale High School in 1949 and during her high school career she was popular and took part in all activities of the school. Since finishiing she has been employed in the local office of Southwestern Bell Telephone Company. The bridegroom is the son of Mr. and Mrs. Jake Pounders. After finishing from Rockdale High School in 1945 he entered the U.S. Army where he remained for some time, seeing service in Japan. He is employed at the Fred Pounders Service Station. Mr. and Mrs. Pounders will continue to make their home in Rockdale. *P.S. . . that 10th day of October in 1950 was also the 23rd anniversary of the birth day of my Dad . . . he would have been 88 today . . .
On this date in our family history . . . the 5th day of October . 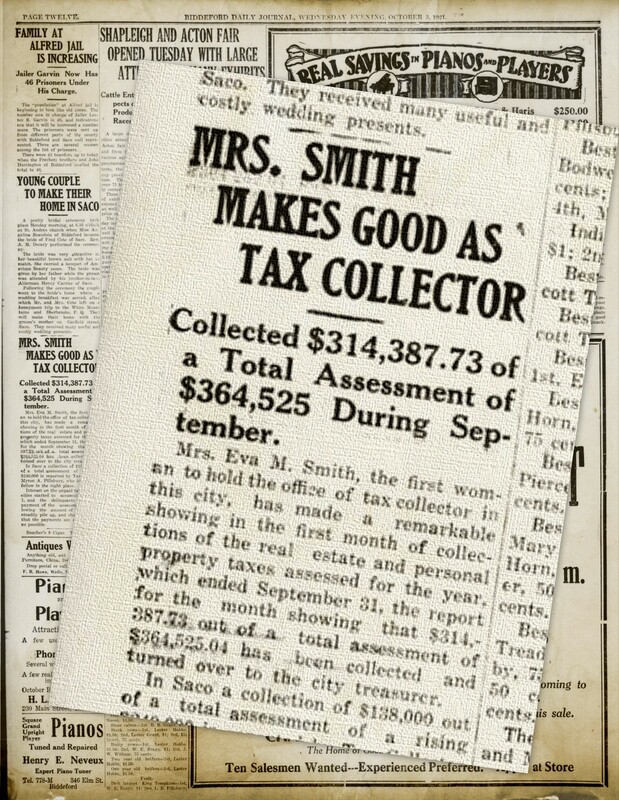 . . in the year 1921 . . . the following news story was published in the Biddeford Daily Journal . . . the subject of this story is Mrs. Eva M. Smith . 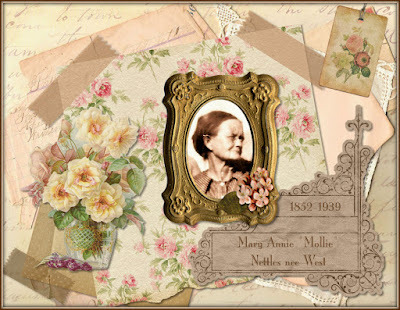 . . who is the great-grandma of the Keeper of this family history blog . 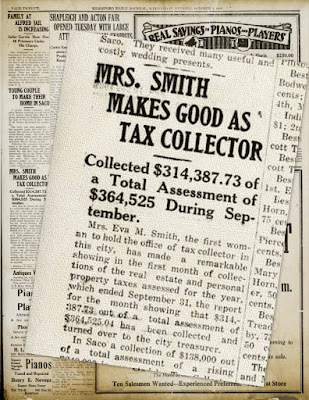 . . and was "the first woman to hold the office of tax collector in this city" (Biddeford) . . . we were totally unaware of this chapter in Eva's life before I happened upon this news clipping . . .
On this date in our family history . . . the 5th day of October . 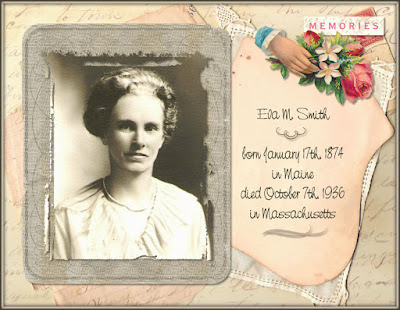 . . in the year 1912 . . . Elizabeth Marilla Smith is born in Biddeford, York County, Maine . 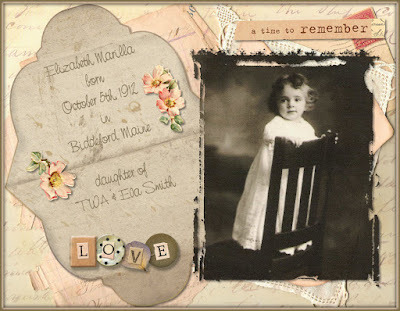 . . this Elizabeth is the maternal grandma of the Keeper of this family history blog . . .
On this date in our family history . . . the 2nd day of October . . . in the year 1688 . . . Mary Richardson becomes the wife of Captain James Fowle . . . they would have at least a dozen children before the death of James in 1714, after which time she marries Deacon Samuel Walker . 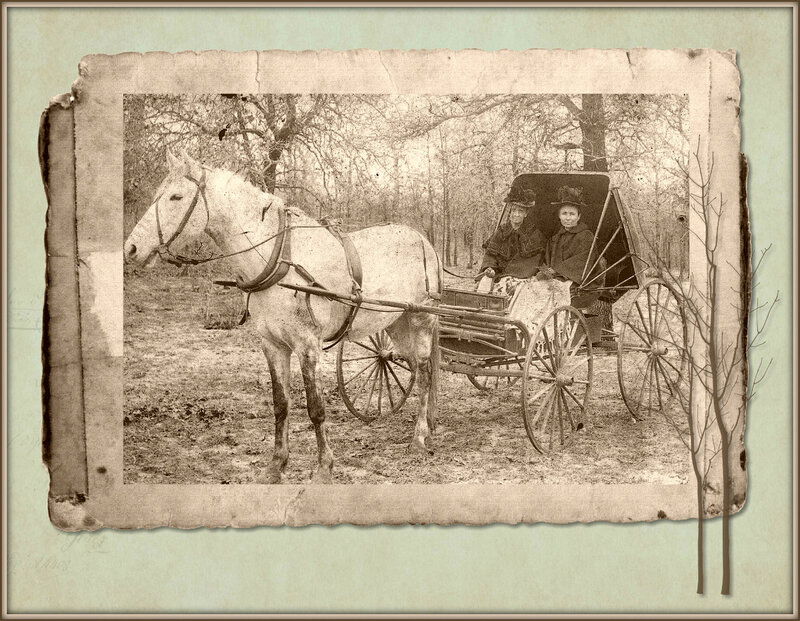 . . this Mary and James are 8th great-grandparents to the Keeper of this family history blog . . . and the following information about them can be found recorded in Volume III of Historic Homes and Places and Genealogical and Personal Memoirs Relating to the Families of Middlesex County, Massachusetts . . .
Captain James Fowle, son of Lieutenant James Fowle (2), born at Woburn, March 4, 1667, died there, March 19, 1714, aged forty-seven years and fourteen days, gravestone; married, October 2, 1688, Mary Richardson, born March 22, 1668-69, daughter of Joseph and Hannah (Green) Richardson, of Woburn; she married (second), Deacon Samuel Walker, and died his widow at Charlestown, October 23, 1748, aged eighty years, gravestone. His [Fowle's] homestead was on the site of the present Central House, Main street, Woburn, and he held the office of sergeant in the Woburn militia company from 1693 to 1701, and that of captain from 1712 to 1714. He was called captain in the epitaph on his gravestone now standing in the old yard back of the estate on which he lived. Like other Fowles of his time he had a large landed property. His estate evidently derived from his father, Lieutenant James Fowle, descended to his son, Major John Fowle, in greater part. He was a selectman of Woburn, in 1693-94- 1700-01 (1702 declined) 1703-05-07-14. He was town clerk 1701-14. On this date in our family history . . . the 2nd day of October . . . in the year 1727 . . . Moses Tyler dies in Andover, Essex County, Massachusetts . . . and is memorialized with a tombstone in the Old North Parish Burying Ground in said county . 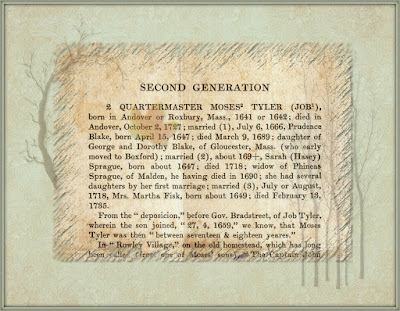 . . this Moses Tyler is a 9th great-grandpa to the Keeper of this family history blog . . . The above image was created from page 17 in Volume I of The Tyler Genealogy by Willard Irving Tyler Brigham . . . the text about this Moses Tyler reads in part as follows (click on the above book link to read the entire story) . . .
Quartermaster Moses Tyler, born in Andover or Roxbury, mass., 1641 or 1642; died in Andover, October 2, 1727; married (1), July 6, 1666, Prudence Blake, born April 15, 1647; died March 9, 1689; daughter of George and Dorothy Blake, of Gloucester, Mass. (who early moved to Boxford); married (2), about 169+, Sarah (Hasey) Sprague, born about 1647; died 1718; widow of Phineas Sprague, of Malden, he having died in 1690; she had several daughters by her first marriage; married (3), July or August 1718, Mrs. Martha Fisk, born about 1649; died February 13, 1735. . . .
On this date in our extended family history . 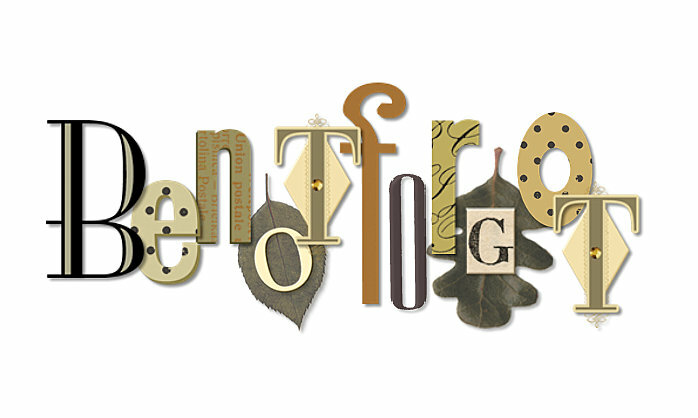 . . the 1st day of October . . . in the year 1906 . . . Beasley Pruett* dies in Dayton, Liberty County, Texas . . . aka B. Pruett . . . aka Bee Pruett . 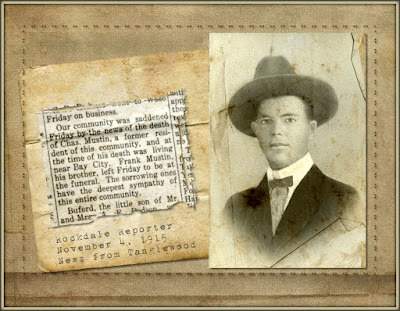 . . he is a 1st cousin three times removed to the Keeper of this family history blog . . . the following story of his death was published in The Liberty Vindicator on the 6th of October 1906 . . .
Says He Killed In Self-Defense. At about eight o'clock Monday night the citizens of Dayton were startled by the ringing out of five pistol shots in quick succession. Then the news that Bee Pruett had been shot to death by Constable Ed. McKinney, while discharging his duty as he saw it. The trouble leading to the murder, as the Vindicator hears it, was caused by a disturbance aroused by Pruett in the saloon and McKinney being called to keep the peace attempted to arrest Pruett when he (Pruett) rushed at McKinney with an open knife and McKinney drew his gun and commenced firing. Three of the five shots taking effect in Pruett's breast. Pruett was a married man and leaves a wife and four children. Constable McKinney appeared before Squire Wilson Tuesday and had his bond fixed at $150.00. *Note that the date of death is wrong on his tombstone.